Carnell's Collison and Repair Specialist in Sikeston held a car show on Saturday. 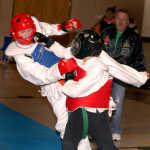 The Taekwondo Advantage Invitational was held Saturday in Sikeston. COLUMBIA -- Sarah Lucinda Pate, 94, formerly of East Prairie, died Oct. 27, 2013, at the University of Missouri Hospital in Columbia. For the complete Standard Democrat obituary log in to our electronic edition. VIENNA, Ill. - Clentine Blaise, 88, died Oct. 28, 2013, at the Hillview Health Center in Vienna. For the complete Standard Democrat obituary log in to our electronic edition. PORTAGEVILLE - Brenda Faye Johnson, 51, died Oct. 26, 2013, at her home. For the complete Standard Democrat obituary log in to our electronic edition. PORTAGEVILLE -- Jimmie D. Jarnagin, 83, died Oct. 26, 2013, at his home. For the complete Standard Democrat obituary log in to our electronic edition. NEW MADRID - Eunice "Violet" Porter, 87, died Oct. 26, 2013, at the Golden Living Center in New Madrid. For the complete Standard Democrat obituary log in to our electronic edition.